The African Film Festival National Traveling Series stops at the Berkeley Art Museum/Pacific Film Archive this spring for its 25th year, acquiring some other film-festival notables on its way. True to its mission to present the best of recent films from Africa and the African diaspora, this year’s edition features dramas and documentaries from Burkina Faso, Senegal, Niger, Tunisia, Europe, the UK and the US. The kid-friendly film in this series is WALLAY, a coming-of-age story by Swiss-Zimbabwean documentary filmmaker Berni Goldblat. Ady, the 13-year-old son of a Burkina Faso immigrant getting into teen trouble in a Lyon banlieue, is shipped back to his family’s remote village in Africa for some tough love. He thinks he’s on vacation, but his Uncle Amadou takes his passport and determines the foul-mouthed, obnoxious little headphone-wearing, phone-staring punk will earn enough to repay money he’s stolen by apprenticing as a fisherman. He reluctantly agrees, but when Ady learns that he’s also going to be initiated into manhood with circumcision, he defiantly tries to find a way out. As he at first resists, then comes to assimilate, the subtle lessons of a culture, we also come to appreciate the firm but gentle parenting of a grandmother who takes responsibility for Ady’s blossoming into adulthood. We can see Goldblat’s documentary roots in the realistically beautiful footage of Burkinabe villages and the pathways in between. 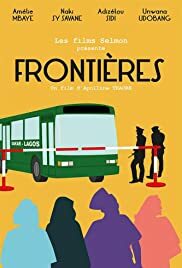 Boston-educated Burkinabe director Apolline Traoré‘s BORDERS is a road movie about women who travel through West Africa on business and have to deal with the corruption and danger of border officers. Naïve first-time trader Adjara boards the bus in Dakar, Senegal, for a week-long trip to buy merchandise in Lagos, Nigeria. She has several national borders to cross, but she already encounters trouble at the Mali checkpoint when she can’t produce her vaccination card and is ordered to pay 20,000 CFA francs in bribe money. She starts noti cing that several of the women around her—from Ivory Coast, Nigeria, Guinea-Bissau—are moving goods, mostly legal but some illicit, and develops an informal support network with them from bus to bus. The four women reveal their dramatic and tragic backstories, some of them encountered on previous journeys, and stand up for each other when greedy men and the laws of free movement fail them. Despite the waiting in lines and threats to their safety, this film celebrates the mobility and sisterhood of enterprising women in a colorful and exhilarating way. Director Aïcha Macky boldly features herself in THE FRUITLESS TREE, a personal documentary about the infertility taboo in her native Niger. Opening with a baby being smilingly delivered by a (childless, as it turns out) midwife, the film switches to the sufferings of women who never get to experience such a thing—and then are blamed for it. Infertility in a country like Niger, which averages 7.2 children per woman—the highest in the world—is “a cancer in my heart . . . a menstrual period is a curse . . . a day of mourning.” But Macky associates childbirth with death as well, since her mother died giving birth when the filmmaker was 5 years old. In losing her mother, she also lost her siblings, who were scattered to the care of several relatives. Now infertile herself, Macky feels she is dying a slow death by not being able to give life. Doctors and sheikhs can help only so much. Giving up the search for the only remaining photo of her mother or even her grave—women are not allowed to visit cemeteries in Niger—she finds supportive radio DJs and their broadcast stories of brave women to keep her spirit strong. The absurdist, visually exciting I AM NOT A WITCH is the debut feature of Zambian-Welsh writer/director Rungano Nyoni and has won a load of prizes over the past two years. A young girl, found wandering through a village, is accused of being a witch and sent to “witch camp.” These are actually said to exist in Ghana supposedly to protect accused witches of being further abused. Here, Shula joins much older women who are put to work farming and breaking rocks, their ability to fly long distances prevented by a streamer anchored to a heavy spool. While the local government charges tourists to visit and photograph them, a magistrate takes Shula around to point out the guilty in outdoor court trials and to make rain. But she chafes at being a “civil witch” and grows into something truer to her name, which means “uprooted” and freed. The film will be introduced by Namwali Serpell, Zambian writer and associate professor at UC Berkeley. The Kino Classics restoration of American Bill Gunn‘s unique and overlooked 1972 Afro-vampire film GANJA & HESS will have already screened in the series when you see this. If you missed it, you can see it on DVD and Blu-ray. But it would be a pity to miss a big-screen experience of Gunn (who died in 1989) and writer Ishmael Reed’s 1980 TV serial manqué PERSONAL PROBLEMS, which has been traveling around the country in its restoration and astonishing viewers with its uncategorizable look at black life in New York City. The low-budget video film is in two parts, which were to be the first two episodes of a longer-running series, a “meta-soap opera,” that PBS turned down and which never aired widely. It begins with the protagonist, a nurse/poet named Johnnie Mae Brown, being interviewed about her tough job at Harlem Hospital’s emergency room. A scene at an outdoor cafe with her girlfriends have their echoes in the films of Spike Lee with their improvised quality and face-to-face confrontations between people who are playful, aggrieved and angry. Johnnie Mae argues with her musician husband over the film RAISIN IN THE SUN and his unfaithfulness. She herself is having an affair with Raymon (played by Nina Simone’s brother Sam Waymon), who plays the piano and sings a love song to Johnnie Mae, her tears flowing freely. Her house is full of people she must take care of, after a hard day at the hospital. When her father-in-law dies, his daughter confronts Johnnie Mae at the wake about not medicating him properly—and Johnnie Mae strikes back. (In fact, her rages make up the best scenes.) Ishmael Reed, who appears as a Reagan-voting conservative in one scene and in person is a curmudgeon who suffers no sacred cows, will appear at the Berkeley screening on Thursday, March 21. I would see it, and him, again if I could. The Festival also plays at Borders, Washington University in St. Louis March 29-31, 2019. Read an interview with the Founder/Executive Director of the African Film Festival, Mahen Bonetti. Mahen Bonetti shares her experience of watching CEDDO directed by Ousmane Sembène. This was the first African-directed film Mahen saw which sparked her love for African cinema. Watch her inspiring TED Talk. Dana Roc interviews Mahen Bonetti at Inspiring People. Frako Loden is a free-lance film w riter and contributing editor to Documentary.org. She teaches film history and ethnic studies at California State University East Bay and Diablo Valley College. She doesn’t like anyone messing with her assigned seat at the Pacific Film Archive. Frako has written for EatDrinkFilms about Japanese film master director Kenji Mizoguchi, Swedish director Ingmar Bergman, French director Jaques Becker, film critic Roger Ebert and Polish animation. Her Twitter page is a good way to keep up with her current writings. This entry was posted in Africa, African-American, Black Film, documentary, Films, Films: Festivals, Pacific Film Archive. Bookmark the permalink.